Two Lions years ago, I declared my intention to contest for the position of 2nd vice District Governor. I cress crossed clubs trying to sell my candidature. I laid bare the programmes I intend to pursue if given your votes. At Ibadan, precisely, on 2nd May, 2015, you freely gave me your mandate. By the mandate, a Social Contract has been established, which enjoins me to deliver service not only to you but to humanity. Again, the Social Contract was renewed at Asaba which concurrently gave me elevation to the position of 1st Vice District Governor. For the past two years, I have learnt a lot and gained a lot of experience from my wonderful predecessors which will put me in good stead to provide good leadership and quality service. While I give all honour, glory and adoration to the Almighty God for all He has done and still going to do, I will be an ingrate if I failed to thank you for standing by me and for all the support and encouragement given me thus far. With the sustained co-operation, it will not be difficult to take our District to a greater height. On my part, I promise to see you all as major stakeholders and companions in service. I am not your boss but fortunate to be “first among equals”. I will work diligently and committedly as we journey together to a safe destination. My fellow Lions, it is with every sense of humility, honesty, commitment and responsibility that I, Lion Asiwaju Ayobla Samuel, whole-heartedly accept to serve as District-Governor, District 404 B2, Nigeria for 2017-2018 Lions year. 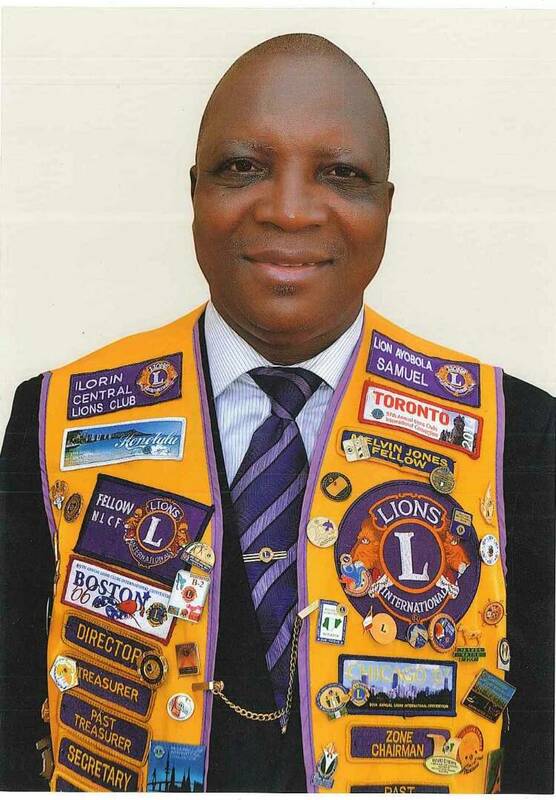 I also promise to uphold the constitution of our Association as well as the Lions code of Ethics and Lions purpose. The 2017-2018 International President, Dr. Naresh Aggarwal’s theme is “We Serve”, the same with the Association’s motto. The coincidence is deliberate because service is still as relevant as it was in 1917. The basic reason for adopting the logo is remind us that service to others is the reason why we exist as global leader in humanitarian services. Since the new policy is to stick to our motto of “We Serve” for the next three years, I have little choice in this regard. But I still feel that it can be slightly amended without watering it down but rather, strengthen our resolve to continue to make more impact in our various communities. My theme therefore is “we serve in Harmony”. Said in a different way, we need to work together as a team because, team work is a divine secret of uncommon success. The strength in Harmonious approach to delivery of service is enormous. No wonder, Helen Keller in one of her speeches said “Alone we can do so little; together, we can do so much”. It is a truism that still stands the test of time. In a similar vein, the great Michael Jordan once wrote that “Talent wins games, but team work wins championships”. We cannot be a winning team, if we are not in harmony. My fellow Lions, I challenge you to let us serve in harmony. We need to stand together to be able to serve those in need meaningfully. It is by so doing that we can build on the foundation laid by past leaders in order to be able to consolidate on our legacies. According to a popular saying “Alone I can “SAY” but together we can “TALK”; Alone I can “ENJOY” but together we can “CELEBRATE”. The District will provide an open, effective and transparent leadership to all. In an attempt to actualize this, every effort will be made, within available resources to enhance the efficiency of the secretariat in discharging its responsibilities to the District. In this regard, the capacity of the existing staff will be improved upon to be able to deliver efficient service and disseminate information to clubs and members effectively. As it is the practice, Region and Zone Chairman will be appointed. We have searched for and selected the best hands that we can find. We expect Region and Zone Chairmen to be alive to their responsibilities. We are not expecting those who want to enrich their CVs but those who can add value to our efforts to achieve our set goals in meeting the aspiration of those who elected me. In line with the structure of LCI which has put in place a DG Team, I will leverage on the opportunity to involve my 1st and 2nd Vice District Governors in the running of the District and effectively delegate responsibilities. Doing this, will give a more practical meaning to my theme of “We Serve in Harmony”. On the other hand, this approach will remove friction and ensure continuity of District programmes, policies and administration. As we are preparing to enter another century in the life of our Association, this time calls for more hands in order to reach wider coverage. The new goal set globally is to serve 200million people annually by 2021. It will be difficult to achieve this unless we embark on aggressive membership drive, float many new clubs and permanently shut exit door. My membership growth plan is to ensure that all the clubs have an average membership strength of at least 20 members. I shall work with my DGT Team, GMT, Region and Zone Chairpersons assiduously to bring in quality members either to join existing clubs or form new clubs, relying more on proper orientation in the process. More attention will also be paid to recruitment of women and youths. Special awards will be given to those who facilitate the formation of new clubs. Our various CBMTs will be strengthened and repositioned for them to be more effective and impactful. It is needless to say that recruitment will be easier when our clubs carry out projects. Clubs will therefore be encouraged to do projects. As it has been generally acknowledged, a knowledgeable Lion is a better Lion. We shall put in place a robust capacity building programmes and create conducive environment that will make Lions to want to attend training programmes. We will also put in place, a GLT team that will drive our training progammes to fruitful result. Shortly before the commencement of the MD convention in Ilorin, RLLI was conducted for clubs presidents, it is from among dedicated and committed Lions among them and previous graduates that we will select those to go for ALLI and FDI. You cannot claim to be a Lion when you refuse or fail to pay annual dues. We look unto every Lion to fulfil his or her obligation to the Association. As we all know, it is our dues that is used to run the affairs of the clubs and District. To assist us to serve you better, I implore every Lion to live up to expectation in this regard. It is also important to pay on time. I want to assure you that timely payment of dues will attract a lot of marks for Clubs Competition. For God’s sake, the idea that I will not pay dues because certain person is the District-governor should stop forthwith. All youth activities, including Leo programme will be given the deserved attention. Youth activities, such as peace poster contest and Lion Quest will be supported. Leo programme, being the feeder team for Lions will be given a close supervision to ensure that they do not derail from the set objectives. The Leo programme chairperson will be given every support to be able to groom the Leos to be responsible youths and invariably become quality Lions leaders in future. Having experienced the devastating effect of sickle cell Anaemia in the past, I want to give special attention to education and enlightenment on sickle cell disease and work with relevant NGOs and groups for support and treatment of victims. It is popularly believed that “Health is Wealth”. In our attempt to drive home this time tested saying, we have opened a discussion with a Medical Mission, based in USA to have a thorough screening and treatment for visual impairment, provision of medications, eye glasses, cataract surgery and dentistry. We are planning and targeting for 3000 people to benefit from this arrangement. We will also explore the possibility of forging partnership with some State Governments to carryout renovation and supply of equipment to selected public schools. This is in line with my campaign promise. I owe my club, Ilorin Central Lions Club a lot of gratitude for giving me a platform to attain this present height. If they had not presented me, the rest would have been history. I promise, with the help of God to be a good ambassador. I am very grateful to my mentor, PCC Prof. Ayoade Adesokan for the guidance, advice and support. My appreciation goes to all past Council Chairpersons, past District Governors and current District Governors. I enjoy every bit of my association with them all. They are wonderful leaders. I must especially appreciate all the past and current District Governors in 404 B2, Lion Alhaji Abiodun Adediji, Lion Dr. Christine Funke Adebajo and Lion (ESV) T.O.S. Adewunmi. They have laid a solid foundation on which I am aspiring to build upon. I sincerely appreciate my dear wife, Chief (Mrs) Folusho Olufunke Christiana, Children and grandchildren for their support and encouragement, without which it would have been impossible to forge ahead in the journey. Finally, I owe all the Lions and Leos of District 404 B2 Nigeria a debt of gratitude for sustained support and encouragement over the years. I sincerely appreciate your show of love and for believing in me. With the help of God, I shall not let you down. As I conclude this speech, I covet the prayers of all and sundry. I rely heavily on your support, encouragement and co-operation. I look unto you as team players. When “I” is replaced with “we”, illness becomes wellness (Shannon L. Alder). I am not under any illusion that the journey from 1st July, 2017 to 30th June, 2018 will be smooth all through. There are bound to be challenges and occasionally, obstacles but I know that these challenges and obstacles would be worked around to make us better and not bitter. With your support, I look forward to a successful and fulfilling year ahead.